“I don’t anticipate any violence whatsoever,” Micah Naziri says. 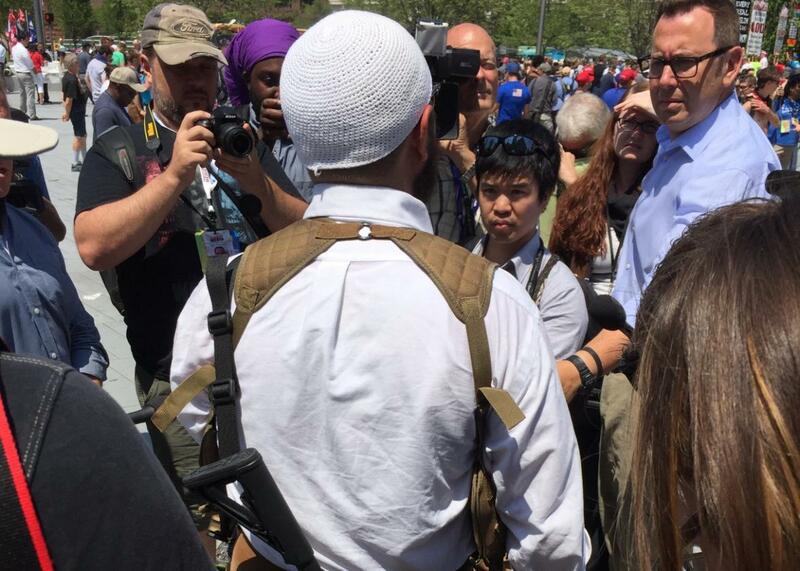 CLEVELAND—On Tuesday afternoon, a bearded man with an AR-15 slung across his back stood in Cleveland’s Public Square, a plaza near the site of the Republican National Convention. That in itself wasn’t that unusual; there are a fair number people with facial hair and weapons milling about downtown. What made him stand out was his white knit skullcap. Micah Naziri, from Yellow Springs, Ohio, was an armed Muslim in a sea of often explicit Islamophobia. He hadn’t had any confrontations, which, he said, was partly the point. “When there’s bullies, and they say, ‘We’re gonna get the Moslems, creeping sharia, we’re gonna stop it,’ and they’ve got their guns, and then somebody comes who is actually well-trained, actually better armed than them and not the least bit intimidated or afraid, they just don’t seem to feel like they want to talk as much,” he said. Naziri and the Bible Believers avoided each other. “I don’t anticipate any violence whatsoever,” Naziri said. “It’s a statement.” All the same, he believes the oppressed should arm themselves. “I think anyone of any historically oppressed group or religious or ethno-religious minority should be arming themselves and training in self-defense,” he said. It will be interesting to see how many of the Second Amendment–loving Republican delegates agree.